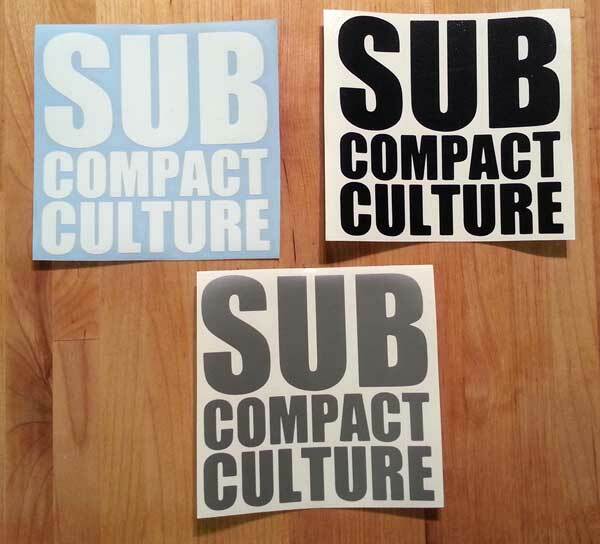 New Subcompact Culture Stickers are here! Show your support for Subcompact Culture with these new vinyl stickers. The above stickers are 4" x 4" and come in white, black, or silver. The style below are 12" x 1" and are available in white and silver. You can buy them directly off of the site either using the link below, or by clicking on the banner on the right column. The price? $1.50 USD each, and all decals include shipping. DISCLAIMER: No additional horsepower or fuel economy gains are expected. Side effects may include the addition of friends, increased attention from love interests, and improvements in overall appearance and self worth.